Introduced into the UK before the Iron Age, this former cornfield ‘weed’ is now listed as ‘vulnerable’. Its petals were churned into butter and added to cheese to intensify the yellow colour. Today’s gardener can appreciate the bright LEMON YELLOW flowers and blue-green foliage of the Corn Marigold more than the medieval farmer, who was penalised when Chrysanthemum segetum was found in a field of corn or grain. ‘Once abundant in cornfields throughout Britain, it is not a true native, but was probably introduced in ancient times with grain. Wide variety of soil types including poor soils, but dislikes lime. It thrives in sunny situations, but can tolerate light shade. We have had it here, grown from a wildflower seed mix with its cornfield companions, BLUE Cornflower, LAVENDER Corncockle and RED Field Poppy. 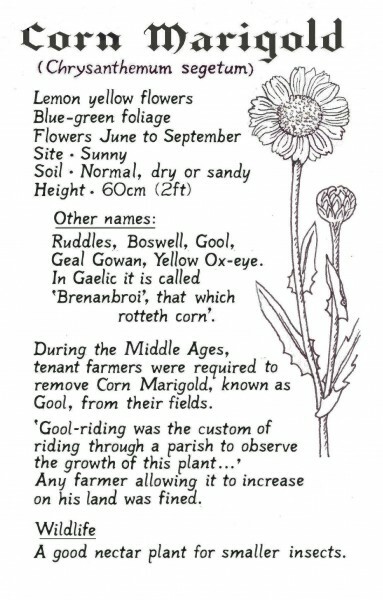 Other names: Bigold, Big gold, Boodle, Buddle, Field marigold, Gill Gowan, Golden cornflower, Goldes, Goldings, Goldins, Golds, Guild Weed, Harvest Flower, Marybuds, Mary Buds, Wild Marigold, Yellow Boy, Yellowby, Yellow Cornflower, Yellow Daisy.